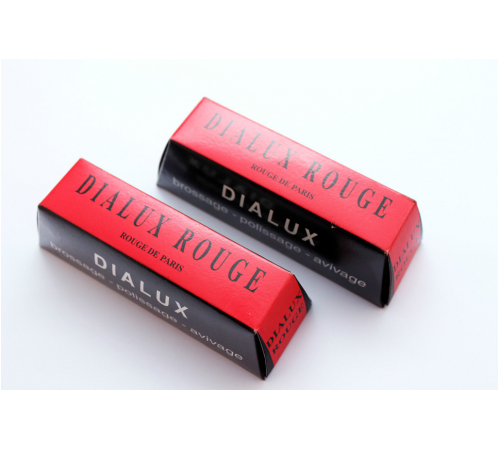 Red Dialux The most popular line of compounds used by Jewelers, Dialux rouges are renowned for the exceptional finishes they impart to precious metals. and is individually packaged in a cardboard container for cleaner handling. Green and Blue are the most popular. FeaturesRed Dialux: For a bright shine on yellow gold and silver. Green Dialux: Medium cutting compound for chrome and stainless steel. White Dialux: For reflective polishing of silver and silver alloys. Blue Dialux: A general purpose polishing compound for all metals. .. The most popular line of compounds used by Jewelers, Dialux rouges are renowned for the exceptional finishes they impart to precious metals. and is individually packaged in a cardboard container for cleaner handling. Green and Blue are the most popular. Red Dialux: For a bright shine on yellow gold and silver. Green Dialux: Medium cutting compound for chrome and stainless steel. White Dialux: For reflective polishing of silver and silver alloys. Blue Dialux: A general purpose polishing compound for all metals.